Create dynamic Microsoft office PPT Presentations with our professional templates containing a graphic of 3d man holding puzzle with word objectives. This image represents the concept of challenges and achievement. It is a useful captivating tool concieved to enable you to define your message in your Business PPT presentations on business plans, targets and strategy. Get the advantage and add personality to your presentations with our stunning presentations. Run the marathon with our 3d Man Puzzle With Objectives Business PowerPoint Templates And PowerPoint Themes 1012. You will come out on top. 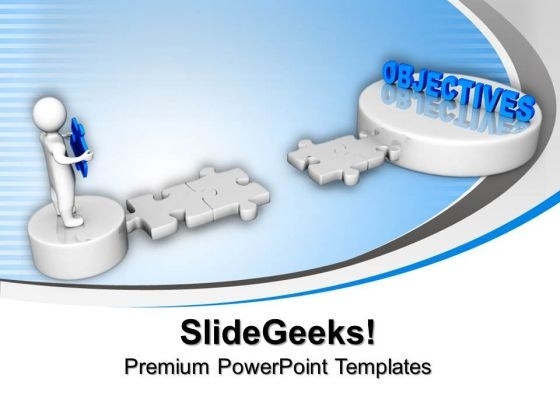 Exploit our 3d Man Puzzle With Objectives Business PowerPoint Templates And PowerPoint Themes 1012 with your ideas. Extract every inch of space on them.